in Social Media, Startup News with tags fashion, mobile app, social media, startup, Swaag Both comments and trackbacks are closed. In vein with this trend, Swaag is a new startup launched earlier this year that allows users show off their wares by brand-tagging their photos. The free mobile app (iOS) creates a unique environment at the intersection of self-expression and inspiration: users can tag and share their looks with the community, give and receive opinions and even challenge others to see who has more Swaag. We spoke with Mark Bufalini, co-founder of Swaag and 360i alum, about where the concept for Swaag came from, how brands can get involved and what surprises him most about the growing community. What inspired you to create Swaag? My co-founder [Peter Chun] and I are both longtime sneaker collectors. We have always had an interest in fashion, specifically street wear and sneakers. We used to share photos with each other via MMS/email, but we couldn’t find the perfect channel to share our photos with a [likeminded] community. We initially created the concept for Swaag three years ago as a website for sharing sneaker photos. As technology got better and camera phones improved, photo-sharing apps became much more mainstream, so we decided to create a mobile app. At the time there were no simple photo-sharing apps in the fashion space that appealed to an audience beyond women. 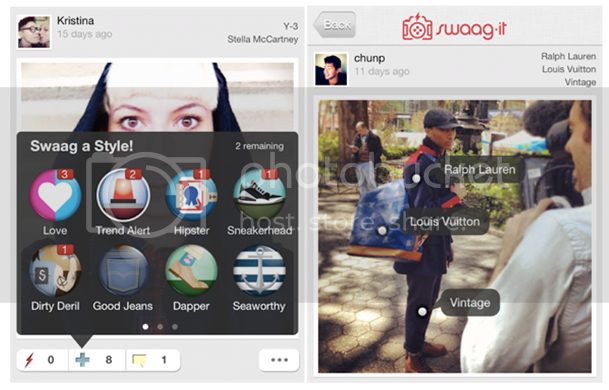 While Swaag is not specifically targeted toward men, we designed the app to appeal to both genders just the same. Where do you see brands fitting in to the Swaag community? Brands can coexist with the user community by sharing photos of new products and by interacting with users that may be potential customers. By working with Swaag, marketers can create custom photo pages of user-generated content and use Swaag as another marketing channel. Without giving away too much, we’ll soon have tools available specifically for brands to help them connect with not only existing, but new customers, too. One of the most unique things about Swaag is that users are sharing products they actually own and love in a very natural way. In some of the other social networks such as Pinterest, users are curating content around things they love, want or aspire to own. Our community shares their style in a way that’s never been done, by adding tags as a layer of information to the photos. The tags will eventually become a gateway to more valuable content for the consumer. This can be through the form of commerce or more relevant content relating to the brand. Brands will be able to visualize their actual customers in different ways and see how their customers are using their products. It’s also likely an interest of marketers to know how consumers are accessorizing their products alongside those of other brands. What has surprised you most about the Swaag community? The biggest surprise is users are sharing and tagging photos that are more than just fashion. Almost 30 percent of tagged items are non-fashion related (gadgets, electronics, cars, beverages, music and more). As a result, we tweaked the UI and included an “other” category for these non-fashion related brands. Additionally, almost 30 percent of app activity currently comes from international users. It’s pretty cool to see users from across the world interacting with each other and asking for fashion advice, tips and more. What’s even more surprising (or maybe not at all surprising to us) is that men make up 60 percent our audience. Currently, all the other fashion apps are marketed toward – and dominated by – women. You can download Swaag for free in the iTunes Store.